Further details regarding the Luna Scholars program can be found here. We Want You to be a Luna Scholar! The Luna Scholars is the legislative internship/fellowship program affiliated with the Senate Hispanic Caucus and administered by the Senate Hispanic Research Council. It grants promising young individuals the chance to work a legislative session full-time in the office of a state senator in an effort to cultivate the government, business, and community leaders of tomorrow. This unique fellowship program is named after the late Gregory Luna, a long time Texas Senator, a strong education advocate and one time chair of the Texas Senate Hispanic Caucus. 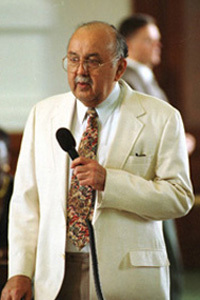 During his tenure in the Texas Legislature (1985-1998) representing Bexar County, Senator Luna was a champion of the people and strove to dissolve barriers for Texas’ less fortunate citizens.